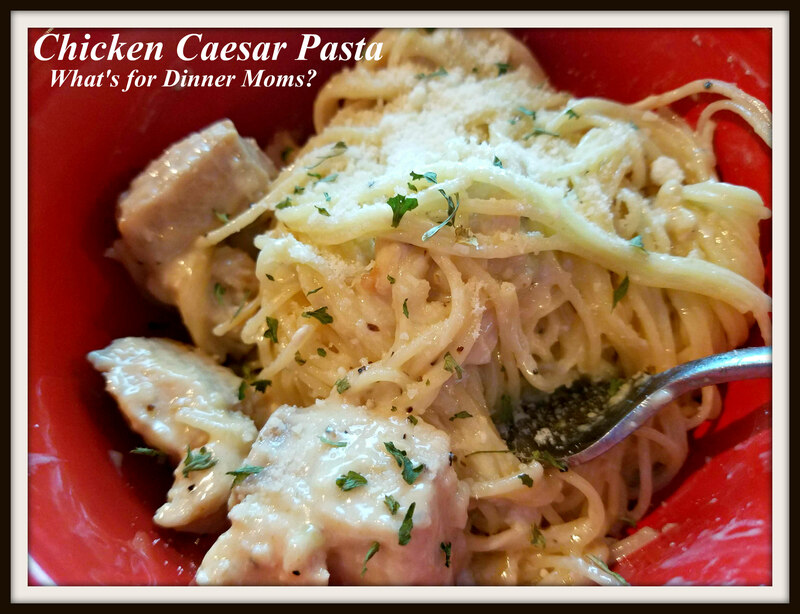 Chicken Caesar Pasta – What's for Dinner Moms? We had our first snow day yesterday! I love having my family all home together. I wasn’t sure with my daughter having to travel for college if they would be closed or not but they were. We were able to get the Christmas trees up, bake bread, roast a corned beef, and play a family game. It was a nice relaxing day for all of us who came back from Thanksgiving with colds. I love super simple dishes for dinner. This dish was extra easy to make with angel hair pasta (cooks up really quickly), a good bottled Caesar salad dressing (all you have to do is pour!) and some cubed raw chicken breast. Adding bacon is a delicious touch but if you don’t want to cook the bacon or take the time to the dish is delicious without it too. My family loved this dish. I loved that it was on the table in under a half an hour with a salad and a vegetable side. The angel hair pasta, bottled dressing, and cubed chicken breast make it partially homemade and super simple. Tip: When you are preparing your chicken breasts for the freezer cut some into strips, some into cubes, and fillet a few so they are already to go on busy weeknights. A simple flavorful pasta dish that is ready in under 30 minutes. In a large pot cook angel hair until al dente. Drain and reserve 1 cup pasta water. Meanwhile, in a large skillet over medium-high heat, heat olive oil. Season chicken with salt and pepper. Cook until chicken is golden brown and cooked. Remove chicken from pan and wipe skillet clean. Return skillet to medium heat. Add bacon and cook until crispy. Drain on a paper towel—lined plate. Reserve about two tablespoons of bacon fat in skillet. Serve hot with extra Parmesan cheese, freshly ground black pepper, and parsley as desired. Sounds like a very tasty pasta idea!